Brought to you by Daryl. 1- I do ocasionally do memes. I have a category for them. 2- I’ve worked at 24 places in the last 30 years (ok, now I’m starting to sound old). My current employ, at a bit under 2 years, is the third longest stay. 3- I’ve been perusing the Mother Earth New magazine (MEN) almost as long as I have been working. After my father had been a subscriber a couple years, he received an offer from them where you could purchase all of the back issues. He did. I’ve flipped through more the first 120 issues (20 years worth). 4- Paradise Found linked to an online MEN article about solar power. Once we have sold the other house, we will be looking at taking advantage of solar and/or wind power. 5- I watch It’s a Wonderful Life every year at Christmas. Helps put things in perspective, I find. 6- When I started college 20 years ago, it was the second time I had ‘moved away from home’. 7- I know how to milk a cow by hand. Actually, my experience at milking a cow was consistently quite painful, not because the cow was uncooperative, but because my fingers are long enough that they pressed on my palms on every squeeze. Cozy and warm… but easily lost. I saw this at Chris’s over 3 weeks ago. Since then samuel has done it. Before actually making the list, I expected it to be longer. I think I must have been counting some twice. I include motorcycles in this list because I bought them primarily for transportation rather than leisure. – 1981 Kawasaki 440 LTD – I bought this from a guy who went to school with one of my older brothers in 1985. I had been acquainted with him since grade 6, but, knew all of his siblings better than him. Him and 2 of his buddies had all bought bikes at the same time. One of them had an accident and this bike had sit in his fathers garage for 2 years before I bought it. We had to tow it with a car and drop the clutch (several times) to get it to start. This bike was incredibly good on gas, consistently getting over 80 CDN MPG. It wasn’t a great winter vehicle though. By the spring of ’89 Andrea and I were engaged and I discovered that she was afraid of motorcycles. So, it didn’t see alot of use after that. Sometime in the mid 90’s I gave it to my nephew. – 1980 Ford Econoline short wheel base 3/4 ton van – I bought this in late 1986. It had almost 200K km on it when I bought it from the local telco. It had a couple extra spring leaves on each side on the rear axle because at the time the telco’s service guys had at least 1500 lbs of equipment and supplies that they carried around with them, so it looked jacked up. It was hard on gas and brutally cold in the winter, but it was a good running vehicle. During the first few months I had the sentra below, I hardly used the van. My brothers did use it. The transmission died because the transmission fluid got way to low (I’ve always assumed due to a leak). – 1983 Datsun Nissan Sentra – I bought this from my brother in 1989. If I remember correctly, his wife bought it new. It got better gas mileage than most of the hybrids on the market today. In a way, it was a free car because it and its running costs were less than the gas I had been putting in the Ford van. If I could buy a new one of these today, I’d do it in a second. After driving it for about 2 years, I sold it to a second brother who later sold it to a third brother. (Just to keep that straight, the car went through 4 brothers). We all thought it was a great vehicle. It had over 300K km (185K miles) on it before it was totalled in an intersection in Fredericton. – 1990 Nissan Kingcab – This is the only new vehicle I bought in my life. Andrea and I put almost 300K km on this as well. Other than the gas mileage not being as good as the sentra, I liked this truck every bit as much as the sentra. I sold it about 14 years after I bought it. – 1984 Cavalier (technically Andrea’s but when she was given it, she didn’t have a driver’s licence) Andrea’s grandfather gave her her first car in 1993. He was getting a newer one and wanted her to have something to get her license with. The thing I remember the most about his car was that her grandfather never drove it more than 70 km/h and for the first few weeks it shook violently when the automatic transmission tried to shift into overdrive. We saw this one all the way to the junk yard. – 1984 Volvo 740 – I regret buying this in 1997. I didn’t know that it was the European model until I started getting work done on it. So, getting parts for it was harder & more expensive (alternator – $600). When it was working, it was a nice car. It had had a fair amount of work done on it by a questionable backyard mechanic. I wouldn’t use this one to gauge the brand. I’ve known quite a few people who owned volvos and swore by them. – 1989 Cavalier wagon – I bought this at a federal government surplus auction in 1998. It need some work at the start. But, I liked this cavalier quite a bit better than the 1984 version. We sold this to friends of ours at a very low price because they were in need. – 1992 Chev Beauville van – When Emma came along we needed a vehicle that could carry at least 6 people. In early 2001, we were shopping for used mini vans and found this. For its age, it had really low miles and had only had one owner who only drove it in the summer. It cost about 30-40% less than comparable minivans. We sold it this year. It’s gas mileage was quite a bit better than the Ford van (due to a smaller engine) and except for fuel costs we did really well with this Chev. – 1995 Yamaha 535 Virago – In 2003, I wanted to get a second vehicle because Andrea does alot more driving in the summer. This was a nice compromise on economy and enjoyment. If I’d driven the van the extra miles required to share the van and take me where I drove the bike, the gas cost alone would have comfortably paid for the bike. I sold it in 2005 for $300 less than what I paid for it. – 2001 Ford Focus – I bought this last year and went for a newer vehicle because I knew I’d be travelling across the province twice a week for an indefinite period of time. I think we have put about 80K km on this since we bought it. Unless we have an accident, I expect we will see close to 300K km on this one too. I think the Focus may be a redesign/remodel of a European car. We are planning on buying a second vehicle next year and a Focus is on the possibility list. Thanks Christine for asking me to do this. You can see how Christine answered the questions below here. Thanks to the person(s) which purchased from Amazon using the link in my sidebar. I owe don & tracy 5 questions from the meme below. I haven’t forgotten, but I won’t be getting to that tonight. Some of these questions remind me more of the stint I did teaching at college than they do of homeschooling. So I answered out of that experience. This is one of those questions I never thought of asking my students while I had the chance. I know that I was a favourite college instructor for some of them. Since I have a number of flaws qualities that didn’t go well in that environment, I’ve always believed that the most likely reason was that I cared more about the students than I did about the college. Well, now I’m a programmer :D. If I could start out fresh and choose a career, it would probably be an artist. Setting an example and hoping it sticks. Officially, I had very thorough lesson plans. In reality I mostly conducted classes using a few notes. It wasn’t unusual for me to start the class off the first item in the notes and carry through the 2 hours without looking at them again. When I was doing it, I never really gave this much thought. I was more concerned with what the students’ goals were. Losing contact with your students. Except for a handful, the only contact info that my student had for me was college related. I’ve only talked to one of my students in the last year. That the student is an object of it. Read my archives, I think I’ve talked that through pretty thoroughly there. I saw this at Doc’s first, but couldn’t leave her a comment. It later showed up in Gem‘s blog. So, I left her a comment. If you haven’t done this yet, and want to, follow the directions at the bottom of the post. 1. What is the last movie you saw in the theater? The Bourne Supremacy (2004) – I didn’t enjoy the movie. I did enjoy the book (about 20 years ago). The first Robert Ludlum book I read was The Chancellor Manuscript. I’m hoping the Bourne Ultimatum movie is better. 2. How many hours/day do you spend on the computer between work and play? 8-9 but 7-8 of those hours are work. I don’t get to play as much as I would like. 3. 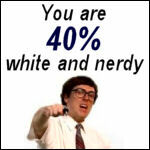 Are you as geeky or geekier than you were in high school (geeky being a good thing!)? 4. What is the most profound thing your kids have taught you? The most important thing in parenting is setting an example. 5. What’s the most unusual blog you’ve read recently? That would be hard to say, except new blogs at homeschool journal, I probably have not read a new blog in close to a year. 1. Leave me a comment saying anything random, like [the food you hate most in all the world]. Something random. Whatever you like. You are romantic, expressive, and hopeful. You see the best in everything. You are very artistic, and you see the world as your canvas. You are also drawn to the written word. Inventive and unique, you are often away in your own inner world. I will be trying to get the house on the market in the next 2 weekends. I am already planning on leaving here on Friday night and returning on Monday at about 9 PM. I will be glad when the weekly round trips are over. 1. Name a movie that you have seen more than 10 times. Lion King, Cinderella, Beauty and the Beast, Cars, The Incredibles, Over the Hedge, etc. 4. Name an actor who would make you less likely to see a movie. Will Farrell, Jack Black, Steve Martin (and a number of others whose names I can’t think of). 11. Have you ever seen a movie in a drive-in? No. 12. Ever made out in a movie? Well, a little. 13. Name a movie that you keep meaning to see but just havenÃ¢â‚¬â„¢t gotten around to it. None I can think of. 14. Ever walked out of a movie? In a theatre, no. 15. Name a movie that made you cry in the theater. The Bourne Supremacy. The way they jiggled the picture around, it was brutal on the eyes in the theatre. 16. Popcorn? Andrea and I share. 17. How often do you go to the movies (as opposed to renting them or watching them at home)? Prior to meeting Andrea about once every 23 years. Since meeting her about once every 2-3 years. 18. WhatÃ¢â‚¬â„¢s the last movie you saw in the theater? I believe #15. 19. WhatÃ¢â‚¬â„¢s your favorite/preferred genre of movie? I choose not to watch horror and/or thrillers (the only exception to this has been the sixth sense). 21. What movie do you wish you had never seen? The exorcist. 22. What is the weirdest movie you enjoyed? Tough one. Aren’t all movies weird in some respect. 23. What is the scariest movie youÃ¢â‚¬â„¢ve seen? See #19 & #21 and draw your own conclusions. 24. What is the funniest movie youÃ¢â‚¬â„¢ve seen? That’s a tough choice. I haven’t particularly been into comedy lately so I’m having trouble remembering the titles of any. Updated: Thanks Andrea 😀 Now I remember one. I laughed the whole way through Rat Race. I saw this at both Carrie‘s and Paradise Found. Wikipedia is a great site. I use it alot. I’m going to post for both Andrea and I (while she recovers). Go to Wikipedia and type in your Birthday month and day only. 2) 1964 – The Beatles occupy all top five positions on the Billboard singles chart in the United States. 2) 1982 – Patriation of the Canadian constitution in Ottawa by Proclamation of Queen Elizabeth II, Queen of Canada. 3) 2002 – Four Canadian Forces soldiers are killed in Afghanistan by friendly fire from two U.S. Air Force F-16s, the first deaths in a combat zone for Canada since the Korean War.